IF you happen to be travelling down the North Luzon Expressway (NLEX) during the Holy Week break, your interest has most likely been piqued by this huge structure under construction somewhere in Bocaue and Sta. Maria in Bulacan. Well, you have just seen what is reputed to be the world’s biggest domed-arena. 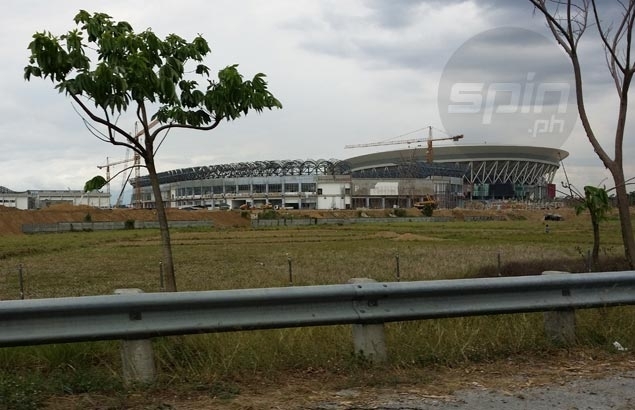 The Philippine Arena, a 74,000-square meter facility that sits on a vast tract of land in Bulacan, is set to open in time for the Iglesia ni Cristo church's celebration of its 100th anniversary on July 27. The domed Arena, which has a seating capacity of 55,000, stands as the centerpiece of a vast complex that will also have a stadium capable of hosting football and track and field events as well as another gym that can hold indoor events like tennis. The facility, which was recently featured in Discovery Channel’s Man-Made Marvels: Quake Proof episode, is being built by Hanhwa E&C firm of Korea at a reported cost of P9.2 billion. Spin.ph learned that the facility will be immediately turned over to a private firm for operations and management after the Iglesia ni Cristo's anniversary celebration, making it ideal to host some of the biggest sports events in the country. PBA games? Most likely. International tournaments like the last Fiba Asia men's basketball championship? Why not. Perhaps a Manny Pacquiao fight? Not impossible. In fact, it could even serve as a satellite venue for future Southeast Asian Games or Asiads. “Pwede po 'yun doon, basta’t hindi po against the doctrine of Iglesia ni Cristo,” said a source, who revealed that only cockfighting and other gambling-related events will not be allowed in the Philippine Arena. The complex will also be quite accesible since it will have its own toll gate in the north-bound lane of NLEX. Parking spaces also are not expected to be a problem in the huge complex.